Note: Updates have been made since this post first launched on 09/24/14. The bottom of this post outlines the changes. Let’s face it. Plugins make our lives easier. Especially on WordPress. Without them, we’d be left having to learn to code for every desired feature, or we’d have pay big bucks to have it done. So it makes sense that we install plugins to handle just about anything from Analytics to zebra striped backgrounds. When it comes to social sharing, there are scores of WordPress plugins, and at the top of the list for many is Shareaholic. This app does more than just provide sharing tools. It will also display related content, which is a great way to keep visitors within your site. What the powers-that-be behind the tool don’t tell you up front is that affiliate linking for your blog is turned on by default. 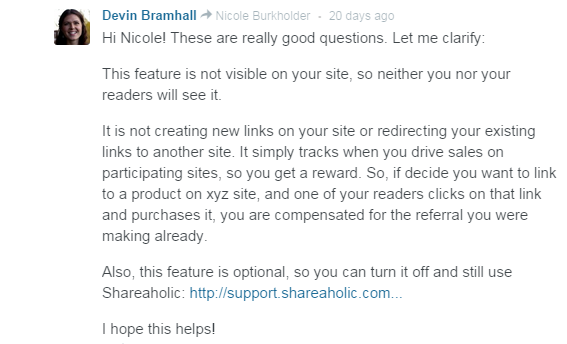 This feature is, according to Shareaholic, a way for publishers to be compensated for traffic driven to other sites. They do this by “leveraging partnerships with merchants”, which really means Shareaholic has its own “publisher” affiliate accounts with various merchants. See that reference to viglink? That’s a service that changes existing links to affiliate links. It’s used, legitimately, by many bloggers, on their own accord. So, I took to the WordPress admin and went through every plugin that may have a reference to any of the strings in the above URL. I found my Shareaholic Site ID was a match! My site ID was included in the URL, which was rewritten from my partner link. For this reason, any existing or potential clients who signed up for the Constant Contact trial did not fall under my account. That’s a big deal when, as a partner, I offer several additional services (some free) for those who go through my partnership account. While the admin mentions I can ‘unlock’ a monetization feature, it does not disclose that this is turned ON by default. Since I wasn’t interested in monetization, I didn’t click the unlock button. No mention of monetization or affiliate linking. Notice the third setting down: Affiliate Links. This is turned ON by default, allowing your outbound links to be rebranded. But, I found another disturbing issue. Every install of this plugin I’d done for others? I have access to configurations. I could configure features for a total of four different websites, and I never used the “Add Website” function! That means if YOU use Shareaholic, there’s a chance anyone else you’ve installed it for is under your total control. So far, the only relationship I see between the sites I unnecessarily “manage” with Shareaholic is the email address associated with the WordPress login used for the install of the plugin. [UPDATE] I must have created an account via the plugin itself at least for one site. But, I swear, I still didn’t click that Unlock button. Though Shareaholic admits that if you’re logged into their website, and you work on someone else’s Shareaholic plugin, that account does get associated with you. Wait, what??? [UPDATE #2] After testing by creating two other accounts, I realize I did not setup a full Shareaholic account. This means my own site, and all the profiles beneath it, were confirmed by one authorization via Twitter. Posted in the WordPress Forums at the beginning of September. Note the line, “The affiliate revenue your links generate is for you :)”. Does this mean Shareaholic is going to pass 100% of the revenue generated by Affiliate Linking to the users? Not at all. In fact, Shareaholic won’t even tell you how it will calculate your earnings, only that “percentages vary depending on costs, content and performance”. Posted two days later in a comments section, by the same person! The last update to the TOS was July 2014. 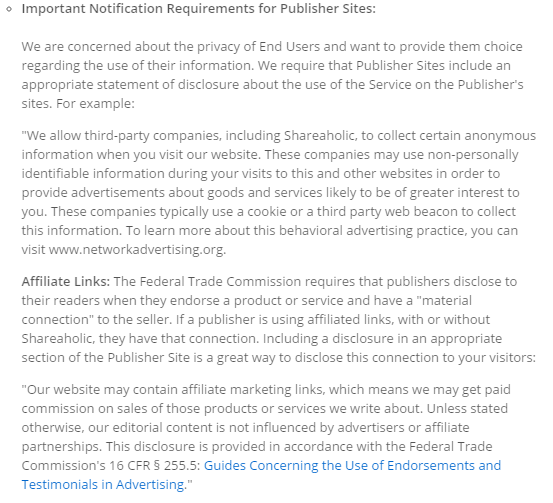 The Affiliate Links “disclosure” for publishers is there, but there is no mention of YOU giving Shareaholic permission to write links on your behalf. Oh, and VigLink also says this disclosure is necessary. At this point, I’m convinced they’ll say anything. 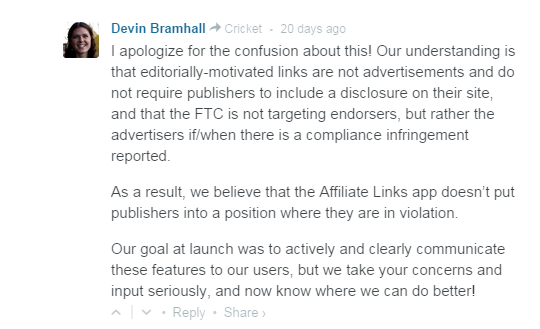 The Affiliate Linking feature does not “simply track”. If that were the case, my partner URL would have resulted in created accounts falling under my partner dashboard with Constant Contact. Granted, the users were still sent to the proper website, but all branding was stripped because the “rewrite” of the link gave credit to someone else. It is misleading to say it’s not a “new” link, because that’s exactly what it is. It is swapping out the link you coded with a different one. This proves that every user of this plugin, even those who did not create an account, are affected. 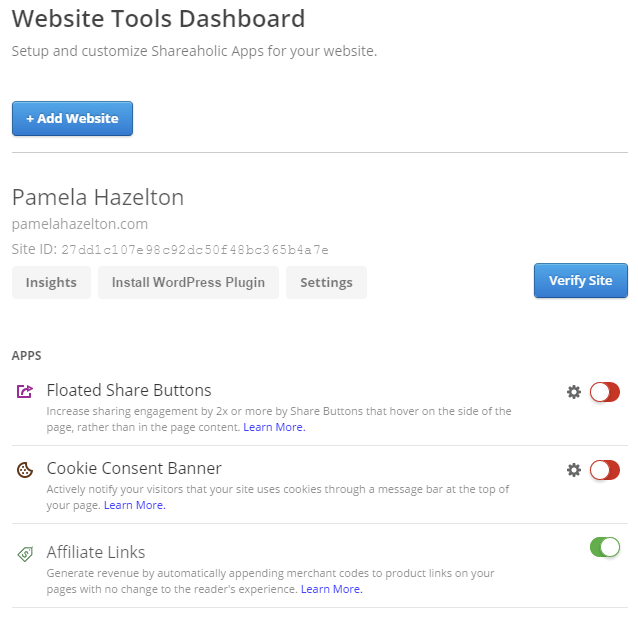 On the Shareaholic plugin admin, which is the first page a user lands on after installing the tool, it clearly directs you to sign up for a free account to unlock features, including monetization. How is it that every account is monetized by default, even without account creation? 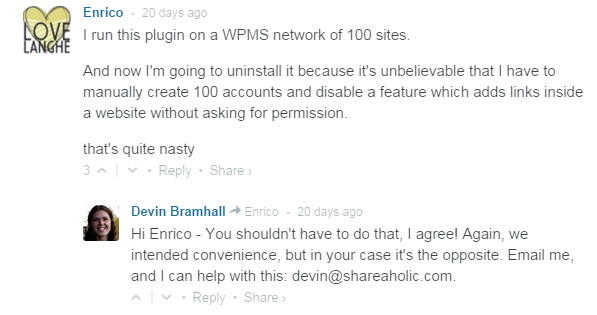 Even Shareaholic does not dispute that the feature was turned on for every WordPress site where the plugin is installed. Oh, there’s also the email I received on September 2nd, when I first installed the plugin on my own site. This is the only email I’ve ever received from Shareaholic. As early as day one, Shareaholic has repeatedly assured users that it’s listening. Yet, they haven’t changed the feature to opt-in. Why? My guess is that the vast number of users have no idea they’re making Shareaholic money, and no idea that they’re potentially due money because Shareaholic has done nothing to inform them directly that this feature is active. While Shareaholic says this feature does not rewrite any existing affiliate links, there are hundreds of bloggers who say it has swapped out links, costing them money. What’s worse? It doesn’t recognize “referral” links the same way. Shareaholic says you can opt to turn off rewriting for specific links by including rel=”nowrite” in the url, but it seems to ignore any other parameters that would also give the indication that the link is already branded. 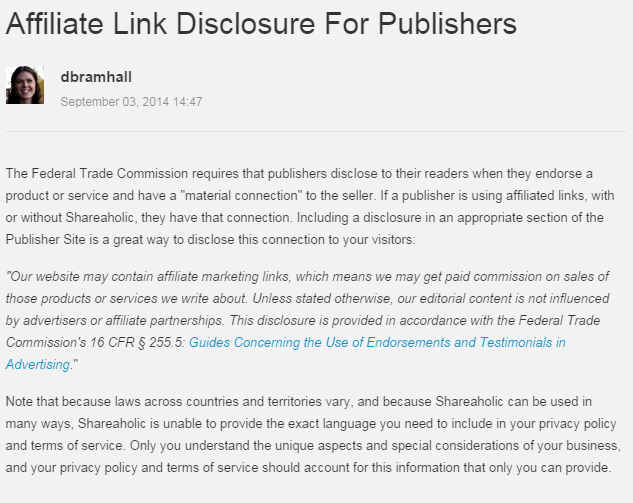 If you use Shareaholic, and the Affiliate Links feature is turned on (and it will be unless you turned it off yourself), you could be losing money. Any affiliate links that wind up being rewritten means the commission goes first to VigLink (who takes a cut), and then to Shareaholic (who takes an undisclosed amount). This will continue to occur with any lead generating links affected, as well as affiliates or partners who may pay you at higher scales for referrals who buy over a lengthy time period. Could I have just turned off Affiliate Linking and gone on with my day? Sure. I turned it off immediately and all links now function as expected. Then I uninstalled the plugin. The way I see it, if you hijacked content on my website, leaving me vulnerable (and costing me 6 hours of time troubleshooting), you’ve no right to make money off me any other way. That includes monetizing shares on my site by showing advertising to social users. I’d love to see the agreement between VigLink and Shareaholic because, according to this, the latter has told the former it has authority to control our websites. And, if you use (or did use) Shareaholic, I’d love to hear from YOU! Did you experience any of the issues I’ve outlined above? Thanks to More from Your Blog, who boldly posted about this issue earlier this month. It was their post that got me hunting deep, all the more shocked at what I found. [UPDATE] While Shareaholic has since made this feature opt-in, it appears all existing sites for which it was originally opt-out are still affected (it does not appear they backrolled that setting). 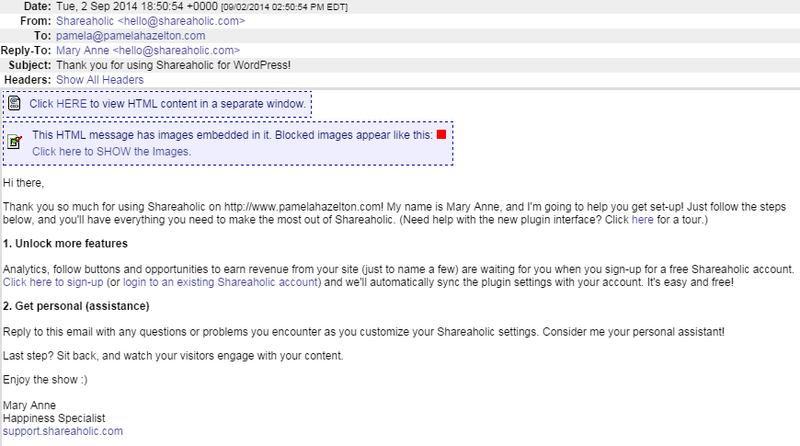 This issue affects ALL users of Shareaholic, even standalone sites (those not using the WordPress plugin). 1. 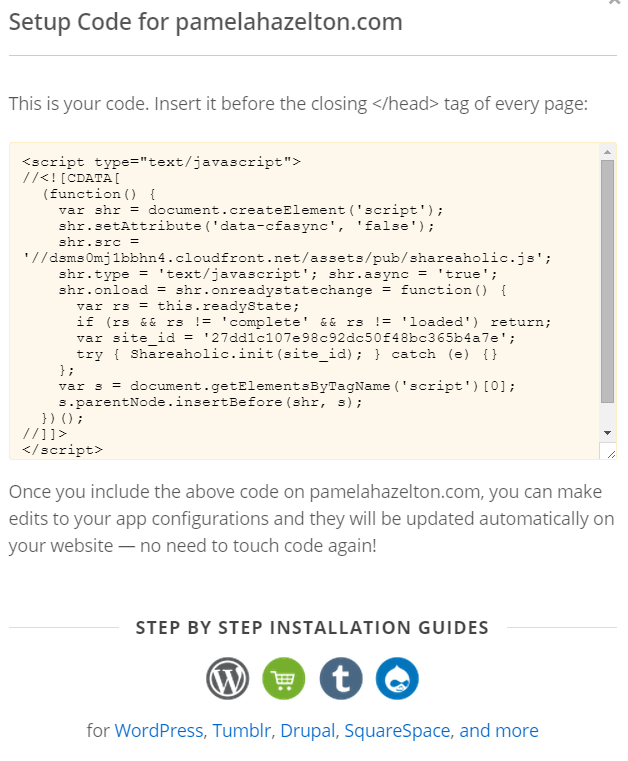 I went back into the Shareaholic settings page (at their site, as I’ve deactivated the plugin), and clicked on GET CODE. This is the script for running Shareaholic on many types of websites, not just WordPress (but it would work there too, without the plugin). 2. I took the script and plugged it into the head tags of a verified website. 3. 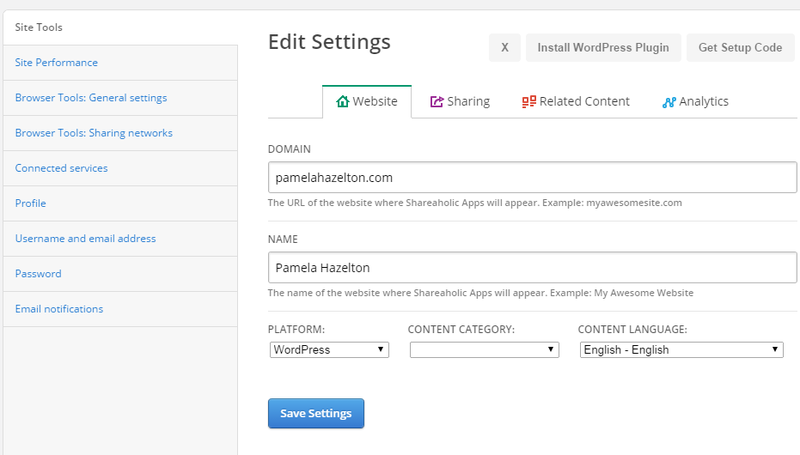 I toggled the Affiliate Links on in Shareaholic settings. VOILA – link rewriting. This means that if you have the above script installed on any of your sites, you could be affected. Shareaholic claims it services more than 340,000 websites – I wonder how many owners of those sites realize this issue? [NEXT POST] How deep does this go? Here’s how I can hijack my clients’ followers by “intercepting” social sharers and account buttons. 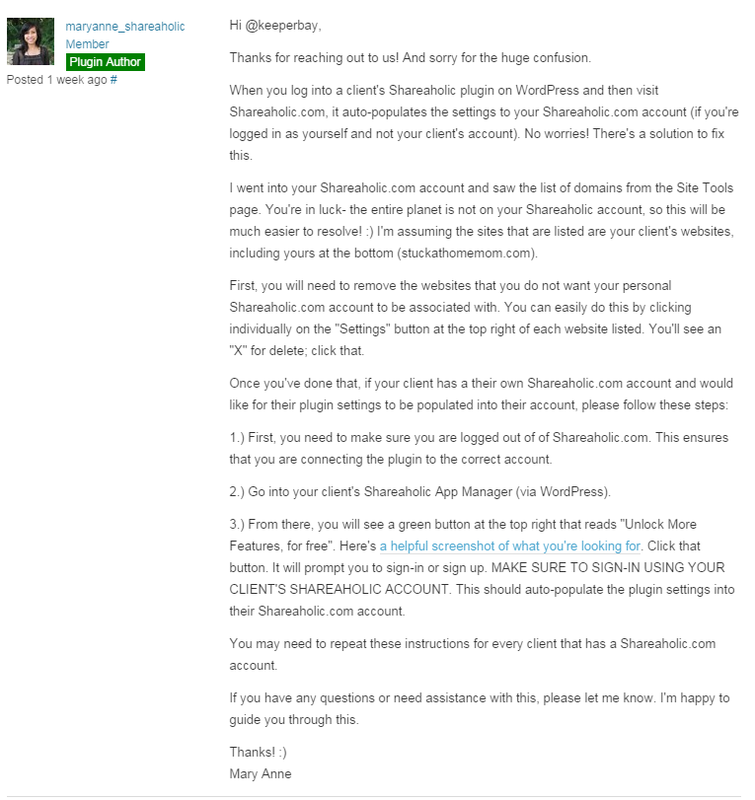 [THIRD POST] A response to Shareaholic’s blog post because they deleted my comment. Read: An Open Letter to Shareaholic. UPDATE!!! Shareaholic appears to be making some changes. Today they changed the plugin description to include monetization, and it appears Affiliate Links is now opt-in. I’ll be posting all updates I find in the Open Letter post! Be sure to head over there for the entire process. UPDATE!!! Shareaholic has posted a blog on a few of the issues outlined in this post. 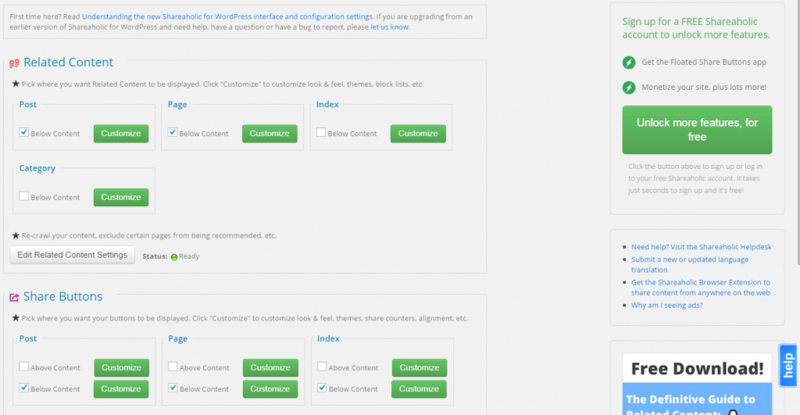 You can read: Clarification about Shareaholic’s Recent Product Release. I did respond to the post, but they disapproved my comment. I’ve posted my comment at Reddit should you want to read it. I also posted an Open Letter. [UPDATE] How deep does this go? Here’s how I can hijack my clients’ followers by “intercepting” social sharers and account buttons. [UPDATE] This issue goes beyond WordPress. It affects any website utilizing Shareaholic, even if you aren’t displaying any tools. See the bottom of this post for details.